Bob Symons -- Who was this man? His name will be forever associated with Bishop and the Sierra Wave Project. But there is so much more. It was April 19, 1958 - Patriots Day in New England - when Paul Revere made his famous ride at the beginning of the American revolution. However, there are heroes in later years and other locations also. That date happened to be the day Bob Symons had flown a heart patient to Loma Linda for treatment - not an unusual task for him. On the way home he stopped at El Mirage to fly the new BG-12 designed by Gus Briegleb. It was also the year the National Soaring Championships was scheduled at Bob's home airport of Bishop, CA, later that year. This writer was scheduled to be the scorer. Bob knew this, introduced himself and offered to tow her and her 1-26A behind his Piper Tri-Pacer. He dropped her off in a strong thermal and she proceeded to climb with delight. While she climbed, she watched the Tri-Pacer go back and land, saw Bob get into the BG-12 and fly on tow towards her direction. Next she saw cars heading from the airport to a spot under where she was circling in a thermal. She saw a red cross on the Dry Lake beneath her (the BG-12 leading edges had been painted red). Bob Symons was gone. Robert Francis Symons was born on April 2, 1910, on the family ranch near Bishop. He spent much of his life outdoors on the ranch and in the majestic Sierra Nevada just a few miles to the west. He discovered gliding while he was a student at Riverside Junior College, California. He lost his leg in a hay chopper accident in 1936 and used a wooden leg for 22 years. His positive attitude is reflected in the comment, "I need only one electric sock to keep my feet warm at altitude - saves the battery." He served as a glider instructor during World War II at Wickenburg, AZ. Later he was assigned to the Bowlus Glider Corporation in San Fernando to construct large military gliders. 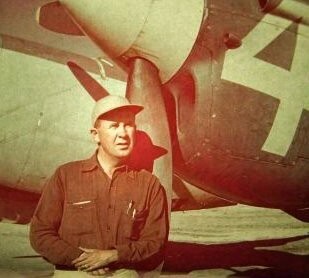 After WW II, he started the Bishop Flying Service, mostly flying special air charter operations, and became well known for his search and rescue efforts, making hundreds of flights in search of downed fliers and lost hunting parties, landing many times in extremely hazardous terrain, far from roads, in order to rescue people who had sustained injuries. He had a contract with the California Electric Power company for cloud seeding - some of the early exploration in that field. He was soon recognized as a mountain pilot without equal. Thus it was inevitable that he began to actively explore the soaring potential of the region - the Mountain Wave. He knew the importance of understanding that phenomenon - not just for sport soaring but for the safety and understanding of all flying in mountainous regions. As he had once explored the Sierra on the ground, now he explored it from the air. Soon many soaring pilots were hearing of this strong form of lift and started making their way to the area to see for themselves. 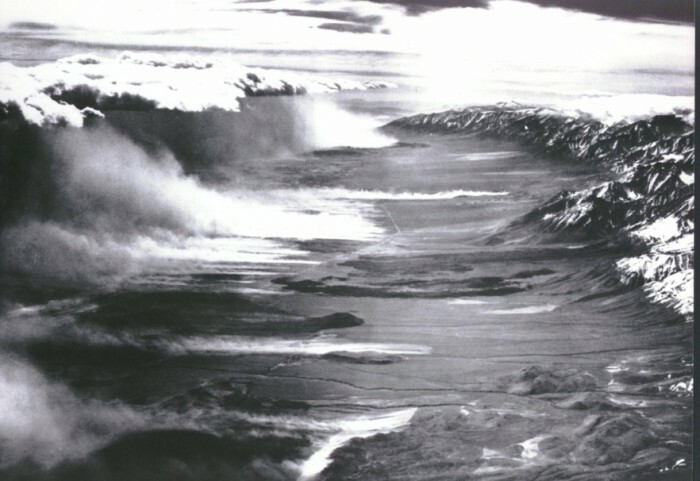 The story of these fabulous conditions soon spread throughout the world partly due to the publication of this famous wave photo (taken from a P-38 flying at altitude with the propellers feathered, looking south down the Owens Valley of California). Many world soaring records were made. Working with other soaring pilots who understood the importance of exploring the mountain wave conditions, he was able to encourage the Air Force and the Navy, along with UCLA and the SCSA, to conduct the famous and successful Sierra Wave Project. For details, see Exploring the Monster by Robert Whelan . Bob served as an SSA Director. He held Gold #7 (1947) and Diamond #12 (Intl #97, 1958) and was awarded the prestigious Eaton Trophy (with Harland Ross) in 1949. He was among the first six recipients of the Symons Three-Lennie Pin in the early 1950s. The poet David Bromley said of him - "Now some will say he has met his fate. 'Twas written no doubt in the book; but where he is gone he will never wait for the cautious who pause to look. He scouts new trails in the other land where the good and the brave hold sway; I know he will tell of vistas grand when we meet him again someday."